Pulitzer Prize-winning journalist Daniel Golden exposes how academia has become a major target of foreign and domestic espionage—and why that is troubling news for our nation's security and democratic values. Grounded in extensive research and reporting, Spy Schools reveals that globalization—the influx of foreign students and professors and the outflow of Americans for study, teaching, and conferences abroad—has transformed U.S. higher education into a front line for international spying. In labs, classrooms, and auditoriums, intelligence services from countries like China, Russia, and Cuba seek insights into U.S. policy, recruits for clandestine operations, and access to sensitive military and civilian research. The FBI and CIA reciprocate, tapping international students and faculty as informants. Universities ignore or even condone this interference, despite the tension between their professed global values and the nationalistic culture of espionage. 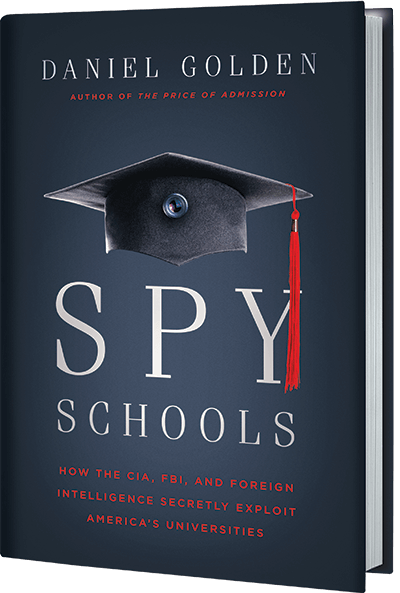 Taking advantage of patriotic fervor and fear in the wake of 9/11, the CIA and other security agencies infiltrate almost every aspect of academic culture and enlist professors, graduate students, and even undergraduates to moonlight as spies. Golden uncovers shocking campus activity—from the CIA placing agents undercover in Harvard Kennedy School classes and staging academic conferences to persuade Iranian nuclear scientists to defect, to a Chinese graduate student at Duke University stealing research for an invisibility cloak, and a tiny liberal arts college in Marietta, Ohio, exchanging faculty with China’s most notorious spy school—to show how relentlessly and ruthlessly both U.S. and foreign intelligence services are penetrating the ivory tower. This website was built using a modified version of Skeleton, created by Dave Gamache and an unmodified version of Normalize, a project by Nicolas Gallagher and Jonathan Neal. It also utlizes the loadCSS script and loadCSS preload script. The logo was created by Jesse Jacobs and used with permission.